We Made It – Nannas Come Marching Home after 1,005.5 Kilometer Walk to the Tip of Cape York The 12 Knitting Nannas Against Gas/Greed who left Cairns on 17 June 2015 to walk 1000 kilometers between Cairns and the tip of Cape York (Pajinka) on the Nanna Dreaming Project, exceeded their target by 5.5 kilometers, despite five Nannas returning home early, support vehicle trouble at Moreton and Laura, heat, dust and exhaustion. 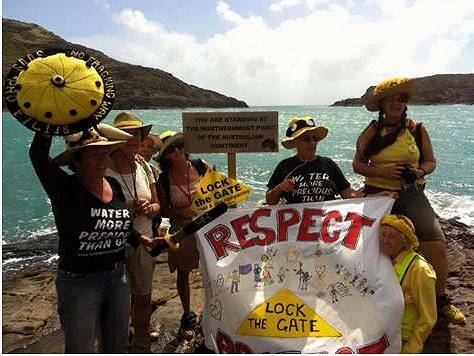 Nine of the Nannas from Gloucester and Lismore in New South Wales, and Brisbane, Cairns and Daintree in Queensland, will reunite this morning at the Cairns Cruise Liner Terminal, Trinity Wharf at 9.30 – 10.00 am to celebrate the successful conclusion of the walk. SpokesNanna for the group, Nanna Purl Stockingstitch (aka MaryBeth Gundrum) said that the support from Cape York residents and tourists was consistently good. Nanna Purl said “The support along the way was absolutely amazing – the Nannas were assisted by two bush mechanics to fix ‘Canhardly’ an older four wheel drive that limped into Lakeland on Saturday after major mechanical problems at Moreton and Laura on Cape York, and people who gave donations of food and fuel to help the Nannas reach the top of Australia.” “We thought we might meet some people who would not like our mission, but even CSG mine workers talked to the Nannas about the negative impacts on communities caused by unconventional coal seam gas mining”. Highlights of the trip were meeting the weaving women of Cape York and First Nation people from all over Cape York at the Laura Dance Festival, a smoking ceremony by Traditional Owners, being walked off country by several groups of traditional owners and a Dingo Gorgeous (Coyote Ugly) performance dancing on tables at Coen which has gone viral on FaceBook. “Some of the Nannas in their sixties and seventies have been pulling 20 to 25 kilometers a day, without a single day off since we left Laura – they are incredible and should be lauded as national heroes.” Nanna Purl said. The Nannas were joined by two documentary makers, Dan Hodgson from Cooktown and ‘Celestial Serpent’ (Mathew Marsh) from Byron Bay on the journey and are now trying to raise funds through crowd sourcing to complete the documentary which will be free to air as soon as they have raised enough funds to complete the Nanna Dreaming Project documentary. Coal Seam Gas exploration is about to start in Far North Queensland. A recent public information day held at Mareeba was visited by 150 people most of whom voiced their opposition to this insidious industry owned and operated by foreign companies, which are exploiting Australian gas reserves to the detriment of the future generation. There will be little or no permanent work for local people of the districts in which the gas wells operate. There is no direct, lasting economic benefit to the people of Far North Queensland. The environmental hazards associated with the ‘fracturing’ method of gas extraction threaten the very survival of underground water supplies. Hydrologists believe the Great Artesian Basin could be poisoned by chemical cocktails pumped underground into the fractured water aquifers and that these subterranean water reserves eventually could be contaminated and drained, effectively depopulating the interior of the State in time to come. A drilling exploration company has been issued with a permit to explore known coal reserves at Mt Mulligan, west of Mareeba, in the iconic Mitchell River catchment. This will be the start of the Far Northern CSG industry. The LNP State Government in totally controlled by the CSG industry and there will be no respite from it. An alliance of indigenous groups, conservationists and land owners has initiated the Cairns rally where more information about this destructive industry can be heard. The Door to Hell is a natural gas field in Derweze (also spelled Darvaze, meaning “gate”), Ahal Province, Turkmenistan. The Door to Hell is noted for its natural gas fire which has been burning continuously since it was lit by Soviet petrochemical scientists in 1971. The fire is fed by the rich natural gas deposits in the area. The pungent smell of burning sulfur pervades the area for some distance. People visiting “The Door to Hell”, a huge burning gas crater in the heart of Turkmenistan’s Karakum desert on May 3. The fiery pit was the result of a simple miscalculation by Soviet scientists in 1971 after their boring equipment suddenly drilled through into an underground cavern and a deep sinkhole formed. Fearing that the crater would emit poisonous gases, the scientists took the decision to set it alight, thinking that the gas would burn out quickly and this would cause the flames to go out. But the flames have not gone out in more than 40 years, in a potent symbol of the vast gas reserves of Turkmenistan, which are believed to be the fourth largest in the world. When I was contracting in the Central Queensland Coalfields 2009-2011 I saw the beginnings of the CSG industry at Moranbah. Arrow was still Arrow albeit in the throws of being swallowed up by Royal Dutch Shell. I believe Prince Phillip has a sizeable stake in this company. I have seen first hand the huge amounts of water needed to operate gas wells. Friends were contracting to Arrow with semi water trucks. It was great lurk for contractors. Having a rural journalism background I could see what was going to happen to our great brigalow belt across Queensland. It is our best grazing and farming country comprising cracking clay soils with high humus content in many cases. Much of this state’s wheat, barley, sunflower and sorghum crops and cotton are grown in this huge area. Many towns and farming communities are supported by this foodbowl, not to mention that it also represents some of best grass fattening country in Australia. Millions of export Jap ox and domestic slaughter cattle have been produced in the brigalow belt for most of the last century.